Arlington Public Schools is set to add seats for 850 high schoolers by 2021, but the key question for school leaders now is how, exactly, that construction might proceed. 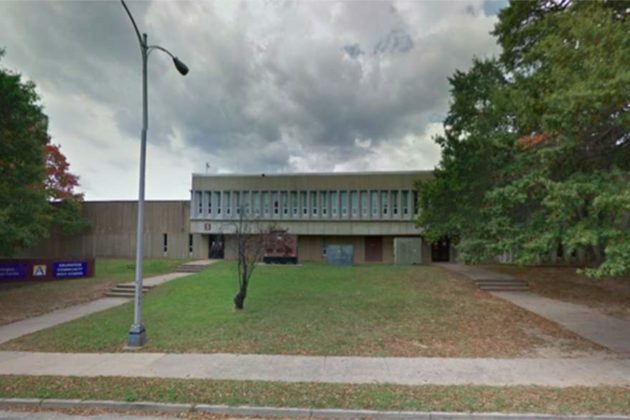 The School Board is gearing up to award a $2.4 million contract for design work at the “Education Center” site adjacent to Washington-Lee High School (1426 N. Quincy Street), where the school system has planned to add space for up to 600 high school students three years from now. Rather than building a fourth comprehensive high school, the Board agreed last summer on a plan to split new seats between the Education Center and the Arlington Career Center just off Columbia Pike (816 S. Walter Reed Drive). But the Board is also weighing a plan to use the Education Center site for elementary school use instead, while accelerating the construction of new high school seats at the Career Center. Another option would leave high schoolers at the Education Center, but still accelerate the Career Center seats. Both plans would let APS build additional amenities at the Career Center site, a notable change as parents in the area raise concerns that students there wouldn’t have the same opportunities — a full complement of athletic fields, for instance — as other high schoolers under APS’s current plans. “We feel like we’re being told we’re asking for too much by simply asking for equality,” Kristi Sawert, president of the Arlington Heights Civic Association, told ARLnow. Superintendent Patrick Murphy is proposing a 10-year construction plan that broadly follows the outline of the deal the Board hammered out last summer — he’s suggesting that APS add space for 600 high school students at the Education Center site and 250 at the Career Center by 2021, then tack on 800 more seats at the Career Center in 2026. That construction would also involve the addition of a multi-use gym and “black box” performing arts theater at the Career Center, with plans to build a new elementary school all the way out in 2029. Yet, at a May 15 work session, county staff presented the Board with two alternatives. One calls for moving the 800-seat expansion at the Career Center up to 2024, while simultaneously constructing an addition for performing arts programs. Then, a few years later, APS would add a synthetic athletic field on top of an underground parking garage at the site. That option would reduce the school system’s reliance on trailers at the high school level a bit sooner, but force APS to delay plans to add more middle and elementary school seats, APS planner Robert Ruiz told the Board. The other option APS staff developed calls for moving the Montessori program at Patrick Henry Elementary School to the Education Center instead, then sending 500 high schoolers to Henry by 2021. By 2024, APS would add 800 seats at the Career Center, which would help replace the Henry seats. That option would also guarantee a full range of amenities at the Career Center by 2026, including two synthetic fields, an underground parking garage, a performing arts addition, a gym and a black box theater. Murphy’s current plan only calls for the gym and theater to be built. 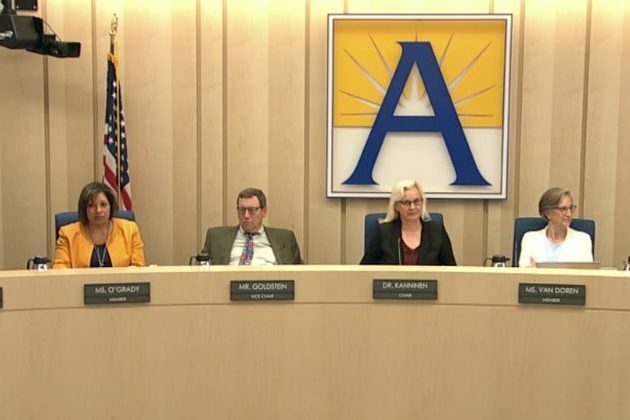 However, it would also be about $10 million more expensive than Murphy’s plan, an unpleasant prospect for Board members after APS narrowly avoided class size increases in its last budget. In all, Leslie Peterson, assistant superintendent of finance and management services, estimates the plan would involve APS spending at least 10 percent of its budget on construction debt from 2023 to 2027, when the school system has long sought to avoid exceeding that 10 percent figure. “Taking on more debt has a higher impact on operating budgets, and that means that’s less we can put into enrollment increases or compensation,” Peterson said. 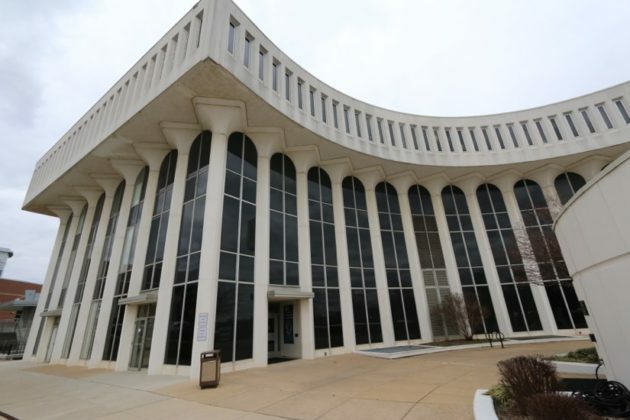 The first alternative, involving accelerating the second phase of Career Center construction, is even more expensive, and could cost $64 million more than Murphy’s proposal. The debt would be a bit more spread out, however, with APS set to exceed that 10 percent figure in just two years. However, Board members did suggest that the County Board could step in to help fund the Career Center construction, though those negotiations are ongoing. The two boards are set for a joint meeting on May 29, as each moves closer to approving their new capital improvement plans. The School Board is set to kick off design work at the Education Center with a vote on May 31, though county staff assured Board members that work will take into account whichever alternative officials choose.